I was walking through Bufutula A with the VHTs visiting individual households answering questions about sanitation when we came across Kawanguzi* and his 16 year-old son digging a hole. Or more appropriately, digging a pit. When I first saw Kawanguzi, he looked so serious. His bold features did not give any indication to the feelings beneath them, so I began asking the quiet man some questions. I wanted to learn his story. A month earlier, Kawanguzi’s latrine was washed out in the severe rains. It undermined the foundation and filled the pit with mud. The roof was no longer secured and the door was missing. Oftentimes latrines are constructed out of local materials such as trees and mud, so severe rains have detrimental effects. It is typical for a family to start practicing open defecation once their latrine is destroyed, but Kawanguzi was determined to avoid that. 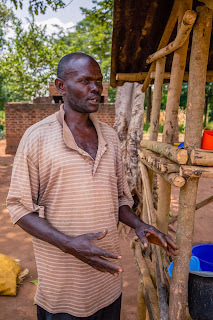 Talking openly about sanitation is not common, but as I chat with Kawanguzi, he does not seem shy despite the small crowd of neighbors and children that has formed around us. He answers my many questions with confidence because he clearly knows the importance of sanitation. Kawanguzi tells me that most people think that building a latrine is work reserved for women, but he doesn’t agree. “It is my responsibility to provide the right facilities to my family. It is my responsibility to show my young son the right habits.” That’s why Kawanguzi was enlisting the help of his 16 year-old son: to teach his son the habits Kawanguzi learned from interns Jake, Debbie, Bridget, Kirsi, and Kennedy in 2016. In addition to the shallow well that UVP built with the community, the interns conducted educational outreaches discussing the importance of handwashing and using a latrine to ‘ease oneself’. As we finished our conversation, I matched Kawanguzi’s feelings of appreciation. He thanked me profusely for the work UVP has done in his village. And I thanked him extensively for acting as a change agent in his community and showing his son how to take ownership of his responsibilities and serve as a dependable citizen to Bufutula A. Behavior change does not happen overnight. The seeds our interns sew and that UVP staff continuously care for over the years take time to flourish. There are many people involved in this slow process, but the most important ones are the community members who take ownership and responsibility to keep their family and community healthy. *To respect his privacy, Kawanguzi's name has been changed.